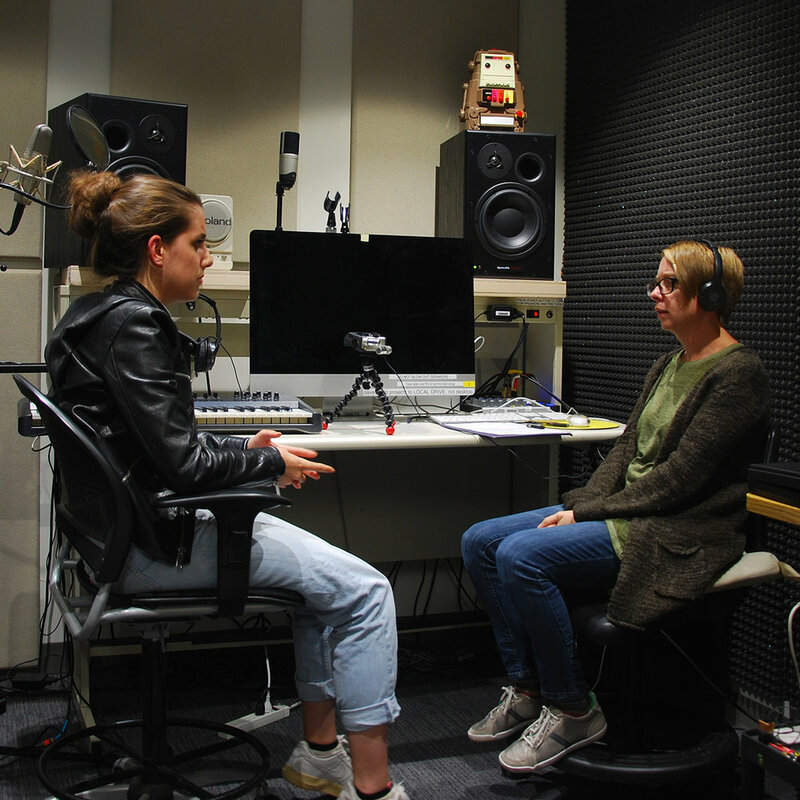 oral history recording workshops and podcast series available on apple iTunes. Inspired by the fact that my Russian great-grandfather gained his US citizenship after serving in the US Army and my Lithuanian (or Austrian, or Russian, or Latvian - depending on who is telling the story) great-grandmother entered the US on fake passport, I am recording conversations about how family stories are passed down from generation to generation and what it means to be American in the contexts of multiculturalism, immigration, military service, black lives matter, white privilege, and indigeneity. Utilizing strategies of documentary and social practice, “We Are All Americans,” seeks to counter xenophobia and foster empathy through humanizing those who have experienced discrimination, migration, immigration and displacement, while also recognizing the complexity of the term “American,” with regard to all nations in North, Central and South America. Supported in part by Side Street Projects and Otis College of Art and Design. Contact Michele to participate. Conversations are recorded by appointment and during scheduled workshops. Season one of We Are All Americans is complete. Season two starts mid January, 2019 with all new episodes featuring Jada Amina, Hugo Claudin, Claudia Hernandez Romero, Kayla Tange and more. Contact Michele if you want to participate. In episode twelve* Chloe Brun (L), who was born in Paris to French and Iranian parents and raised in the United States, talks about the challenges of being multi-cultural and finding one’s place in the world. * Recorded on October 16, 2018. at Otis College of Art and Design in Los Angeles, CA. In episode eleven* Monique Mansour (R) shares stories with Michele Jaquis (L) about her experiences living in California and traveling abroad as an American of Iraqi-Chaldean heritage. *Recorded August 28, 2018 at Loyola Marymount University in Los Angeles, CA. In episode ten* Michael Rippens (L), who is half Dutch and half Filipino, discusses with Michele Jaquis (R) the complexities of being multi-racial and therefore simultaneously fitting in nowhere and everywhere. *Recorded August 19, 2018 in the Chinatown neighborhood of Los Angeles, CA. In episode nine* Badly Licked Bear (L) talks about their life as a gender-non-conforming, American-Indigenous-Jew whose friends think of them as a professional code switcher. *Recorded on August 15, 2018 in the Historic South Central neighborhood of Los Angeles, CA. In episode eight* (L) Christy Roberts Berkowitz and (R) Michele Jaquis discuss the parallels between the US Government’s current anti-immigrant sentiment and the anti-Jewish pogroms in Russia at the turn of the 19th century and the differences between diversity and inclusion. * Recorded on August 2, 2018 in the Chinatown neighborhood of Los Angeles, CA. In episode seven* Michele Jaquis’ friend speaks anonymously about her disappointment after the 2016 US Presidential election in realizing that she and her sister have differing opinions about who is really American. They also discuss how travel can foster empathy and an understanding of the plurality of human experiences. * Recorded on August 22, 2018 at Otis College of Art and Design in Los Angeles, CA. In episode six* Michele Jaquis (R) and Hind Abdulmajeed (L) discuss the increased xenophobia and nationalism in the US now that Trump has been elected president, as well as Hind’s experience as an Iraqi refugee who came to the US for college and political asylum and stayed when she was granted her green card. *Recorded on July 19, 2018 in the Westchester neighborhood of Los Angeles, CA. In episode five* Michele Jaquis (R) and Joshua Beliso (L) share numerous family stories including Michele’s grandfather’s matzo ball wonton soup, Joshua’s family legend of their brutal Scottish ancestor (who may or may not have been a King), how it is possible to not sacrifice one’s ambitions while raising a family just because one’s parents did, and Joshua’s own love for fusion cuisine inherited from his Portuguese and Spanish grandparents who grew up in Hong Kong and the Philippines. * Recorded on July 16, 2018 at Otis College of Art and Design in Los Angeles, CA. In episode four* Cinthia Marisol Lozano (R) shares stories of their experience as a first generation American reconnecting to their Pipil and Lenca indigenous ancestry, as well as how the important radical act of simply living as a queer person of color helps them stay grounded and optimistic. *Recorded on July 11, 2018 at Otis College of Art and Design in Los Angeles, CA. In episode three* Daniel Corral (R) shares stories with Michele Jaquis (L) about his Lola and Lolo, who was recruited into the US military after his time as a Filipino guerrilla fighter during WWII. *Recorded on June 25, 2018 in South Pasadena, CA. In episode two* Lauren Vazquez (L), Michele Jaquis (C), and Estela Sanchez (R) discuss what they know and don’t know about their family histories. *Recorded on May 19, 2018 at Side Street Projects in Pasadena, CA. Photo credit: Lauren Vazquez and Michele Jaquis. 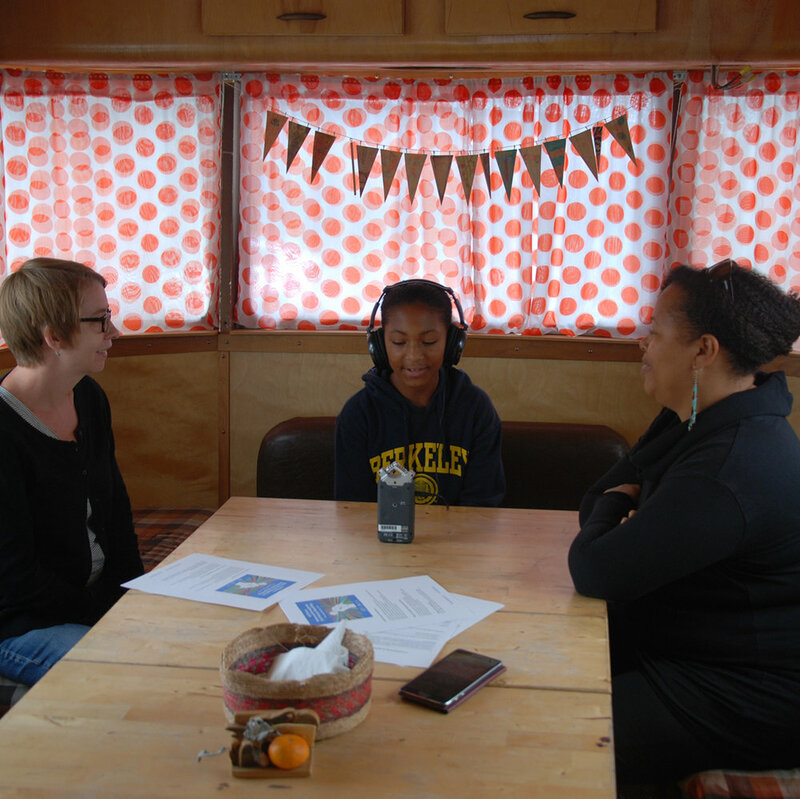 In episode one* Alicia Randall (C) records her mother Ayesha Randall (R) and Michele Jaquis (L) as they discuss those who came to the the US unwillingly and how and when we teach our children the difficult historical moments that impacted our ancestors. *Recorded on May 19, 2018 at Side Street Projects in Pasadena, CA. Photo credit: Lauren Vazquez.